Silverstone is a village and civil parish in Northamptonshire. The village is listed in the Domesday Book. Silverstone is also the current home of the British Grand Prix, which it first hosted in 1948. The circuit itself straddles the Northamptonshire and Buckinghamshire border, with the current main circuit entry on the Buckinghamshire side and built on the remains of a WWII RAF base. Even being at the forefront of technical innovation Silverstone has its roots firmly in the landscape’s past. All the corners of the racing circuit have names, many relating to the local area, as shown on the map. • The first corner on the circuit is Abbey. Named after Luffield Abbey, which occupied the centre of the site from the twelfth century until its Dissolution in 1551 when the land was passed to Sir Francis Throckmorton. • The second, Farm Curve, simply takes it’s name from a nearby farm. 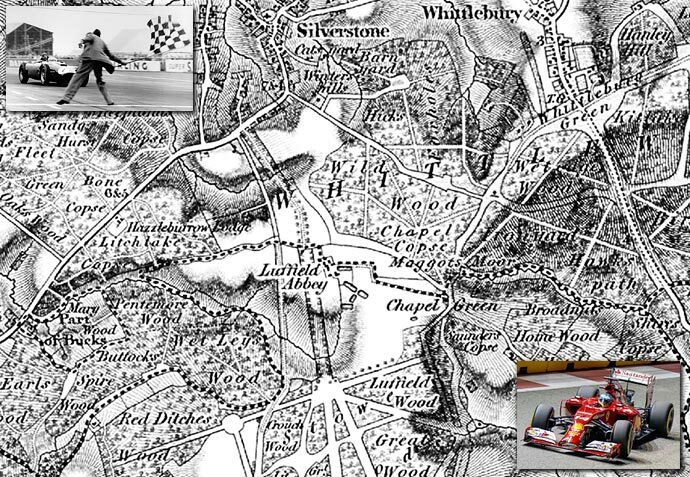 • The third and fourth corners have literal names in Village, named after Silverstone Village and The Loop, the only corner to be named after it’s shape. • Then there is Aintree, named after the Aintree course, where the Grand Prix alternated with Silverstone in the late 1950’s to early 1960’s. • Followed by the Wellington Straight, only named in 2010, which takes it’s name from the Wellington Bombers which flew from RAF Silverstone during WWII. • Next comes Brooklands, named in honour of the Brooklands Motor Circuit, known as the home of British motor racing. • Luffield, like the first corner is named after the medieval Abbey. • Woodecote, like Brooklands, was named in honour of an existing circuit, namely the RAC owned Woodcote Park in Surrey. • Copse corner is named after the nearby Chapel Copse and Cheese Copse that border the track. • The oddly named Maggotts actually takes its name from the adjacent Maggots Moor (written with only the one ‘t’ on the map). • Becketts and Chapel Curve both take their names from the medieval chapel of St Thomas à Beckett which stood near the track features. • Like the Wellington Straight, Hangar Straight takes it’s name from the time of the RAF base. Two of the largest hangars stood in this area. • The next corner Stowe takes it’s name from the local area of Stowe, to the south of the track, famous for Stowe School. • Vale. Although the track is predominantly flat, this is the only undulating area on the track and the probable source of the name. Another theory is that is named after the district of Aylesbury Vale, in which it sits. • The final corner Club is, like Woodecote, named after the famous RAC club in Pall Mall London. This weekend sees Silverstone hosing the British Grand Prix with nearly 300,000 people expected to attend. 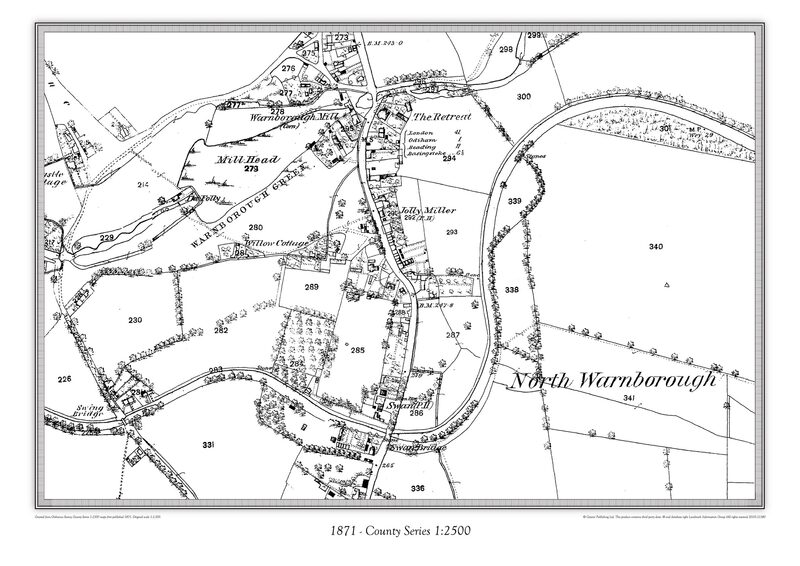 A far cry from the quiet landscape shown on the above 1835 map. 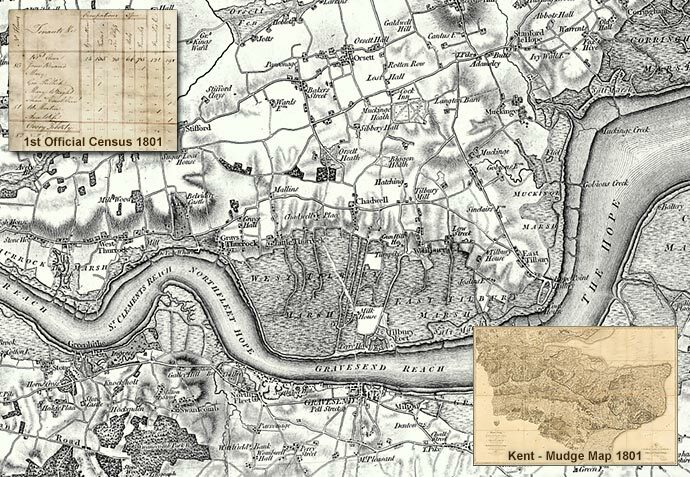 Map of the week – Hebburn Colliery & the Davy Lamp. On the 9th January 1816 Sir Humphry Davy first demonstrated the Davy Lamp. Sir Humphry Davy (17 December 1778 – 29 May 1829), a chemist and inventor born in Penzance in Cornwall, tested his Davy safety lamp for miners at Hebburn Colliery. Three years later Davy was awarded a baronetcy, at the time the highest honour ever conferred on a man of science in Britain. In 1820 he became President of the Royal Society. Davy’s lamp was made public at a Royal Society meeting in Newcastle, three years after the Felling mine disaster in 1812. Davy had discovered that a flame enclosed inside a fine mesh cannot ignite firedamp (a name given to a number of flammable gases, especially methane). The screen acts as a flame arrestor; air (and any firedamp present) can pass through the mesh freely enough to support combustion, but the holes are too fine to allow a flame to propagate through them and ignite any firedamp outside the mesh. If flammable gas mixtures were present, the flame of the Davy lamp burned higher with a blue tinge. Lamps were equipped with a metal gauge to measure the height of the flame. Miners could also place the safety lamp close to the ground to detect gases, such as carbon dioxide, that are denser than air and so could collect in depressions in the mine (black damp or chokedamp); if the mine air was oxygen-poor the lamp flame would go out. Unfortunately the introduction of the Davy lamp led to an increase in mine accidents. Although the principle was perfectly sound the lamp encouraged the Mine owners to work mines and parts of mines that had previously been closed for safety reasons. A contributing factor to this rise in accidents was the unreliability of the lamps themselves. The bare gauze was easily damaged, and once just a single wire broke or rusted away, the lamp became a hazard in itself.